you can now get in a battery-operated smaller size. Perfect for when you are on-the-go! It is no secret we like to travel, and summer is the time to go-go-go. My kids like to go too, and my youngest is Mr. Hotel (he LOVES to be in a hotel room), but one thing he does miss when we are away from home is his electric toothbrush. No way we're taking that though, it doesn't have a cover, it's not easy to pack up and I worry the charger will get damaged in transit. Thankfully, we now have ToiletTree to the rescue! 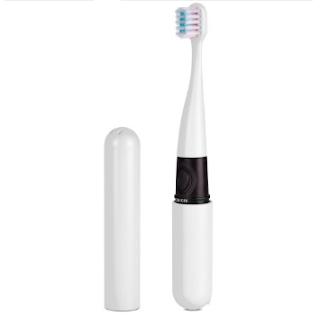 Their Travel Sonic Toothbrush is a slim, compact toothbrush that is easy to carry along anywhere we decide to go. It has a cover to protect your bristles too, which I appreciate. This little gem issues out 18,000 sonic pulses per minute, making it every bit as powerful as the full-sized one my son has at home.The whole toothbrush is waterproof, so simply rinse in the sink and clean-up is complete. It is powered by one AAA battery. Now to purchase one for myself... (and I will!). You can learn more about the travel toothbrush and other great items sold by ToiletTree by visiting their website. You can also follow them on Facebook and/or Twitter. Would you appreciate a battery-operated toothbrush designed to take on the go? WE don't travel as often anymore, but I'd still love have this for the kids and I when we do. It would be great for travel. My dentist always says an electric toothbrush is way better than a manual one, but I never take my electric on with us on the go. This would be perfect for my travels! This sounds like a great travel toothbrush. I need to get one for my upcoming trips. I love travel sized things. I am on the go a lot so I could definitely use this. I have seen something similar here. A great idea. This toothbrush will be very useful when we travel. My youngest son loves his electric toothbrush. This would be great for trips! My current electric toothbrush is kind of cumbersome! This sounds like something I would love to have just in case! I loved my electric toothbrush (it's lost in the closet somewhere) so I need to find that and start using it again. We are on the go pretty frequently so having things that will make our life simpler are always appreciated. The cover is a must for a travel toothbrush. My husband has one of these electric tooth brushes. My daughter likes an electric tooth brush too. Good choice for travel! Wow, this makes me want to travel more. My son is so thrilled about electric toothbrushes! This would be perfect for solo or family travels. You could really just keep it in your bag and ready to go. I have a toothbrush very similar to this. It's perfect for traveling! Nice product. We travel a lot and this is a nice toothbrush for our travelling essentials. Yes!!! Perfect for travel. I have been impressed with Toilet Tree products!